Kia Kaha Christchurch. Kia Kaha to those who lost loved ones a year ago today. Kia Kaha to my family and friends. 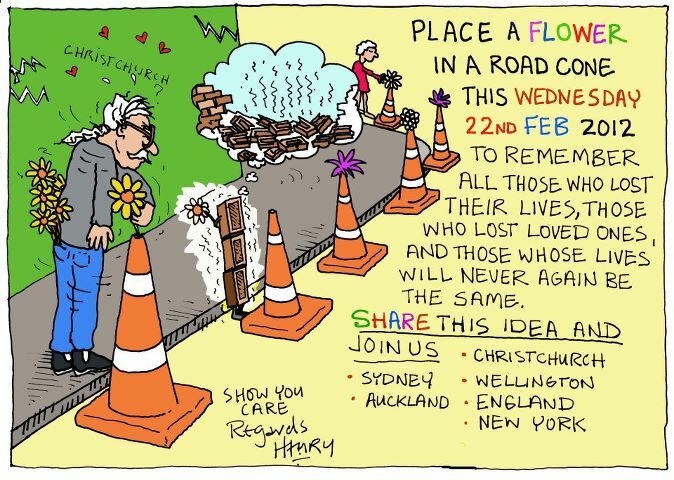 Kia Kaha to those who gave so much in the days and weeks following the February quake. Kia Kaha to those around the world who have lived through natural disasters and seen their lives changed forever. 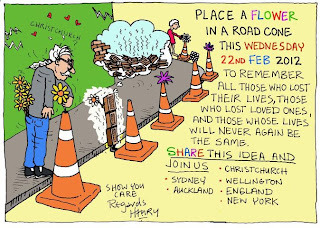 Kia Kaha to those of us who are no longer living in Christchurch. Those of us who could leave and now must watch a community's memorial from a distance. Kia Kaha. Ake Ake Kia Kaha. Three mouths open and scream that I’m too late. They are dead. The world is broken. This ground is no longer hallowed. This is a place where only the dead live and we are its ghosts. I spent a lot of time working in the Red Zone. The decimated and dangerous central business district of Christchurch as part of the earthquake recovery. I remember on a Monday morning in March, it was so quiet at 9.00 am I could hear the pigeons flying overhead. So many iconic buildings have gone. The struggle to find housing and a re-building plan that suits everyone is ongoing. The council has been accused of failing in a number of areas. The main problem is that a disaster on this scale has never happened in New Zealand before. Everyone is learning and revising their disaster response protocols. Even the US government took note. One senior US government official who was in Christchurch on February 22nd said they [US Federal Govt] had always planned for their emergency response, but had not considered how the local community would react and mobilise in the face of a disaster. Their strategy has changed as a result of what he saw in Christchurch. People did come together. Strangers rescued the trapped. People held the hands of the dying and got the critically injured to hospital when ambulance services were overwhelmed. I know I will never forget my personal journey through the central city. Climbing over rubble and past collapsed buildings to get to the place I knew Damaris would be evacuated to. I wore my September 2010 quake souvenir T-shirt that day. I only put it on because I was home (unexpectedly) and it was clean. Somewhere someone has a photo of me wearing it as I walk through ruined streets. I'm wearing the same T-shirt again today. This time it is a conscious choice. A small way of remembering. Being at home with Damaris today was also a conscious choice. As is watching the memorial services on TV. Today of all days I want to be within hugging distance of the ones I love.